They say the best things happen when you’re not looking for them to happen. Well, that is exactly how things went for my family last week. It started with a random text message from my life-long friend Dave, with an online link to a dog available for adoption. He’s a dog person. After losing our Toby a few months ago, my husband, Scott, and I had decided that we would not jump in to getting another dog. We have three cats, so that would be fine for now. Maybe next year after winter. While the dog in the link was cute, I wasn’t interested. But then I started perusing other doggie faces, and then I stopped. Andromeda. “Andi,” for short. About five months old. Potty trained, spayed, chipped, up to date on vaccines. Good with kids. Good with cats. Even Scott couldn’t find anything at fault with this dog! He agreed to let me fill out an application with the rescue, which is what you had to do before you could learn any more information. A few days passed. I kept looking at her cute face on my phone. I hadn’t heard anything. I decided to send an email to see if they got my application. I got a pleasant response back, saying that there had been many applications for Andi, and that they were still looking through them. Usually, I would just let that go, but something told me not to. The application itself was pretty vanilla and didn’t give me a spot to say why I thought we would be a good match for Andi. So, I replied to that email, pleading our case and sharing about our loss of Toby. We just wanted the chance to at least meet her. Well, that worked, as her foster mom said that there was another family interested, but that we could go meet Andi on Saturday! 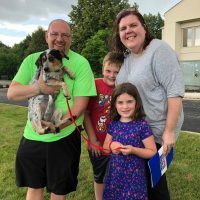 I had to be on Magic 98 for Saturday at the 70’s that morning, but after that, the fam zipped down to Rockford to meet Andi and other dogs that were at an adoption event the rescue was having. When I saw her, I was instantly smitten. She was much more beautiful in person. She was so friendly and started giving us all kisses pretty quickly. She was good with the kids, letting them lead her around the parking lot. We chatted with her foster mom. She made a comment about how much she liked the look of Andi with us. My son, Kieran, asked if we could take her home. I said, “no, not today,” thinking that the other family would be meeting her too. But then her foster mom said, yes! “Yes. You can take her home.” After some clarification, I just started tearing up. The kids cheered. I gave her foster mom a hug, and we got the paperwork done. She was ours! Mind you, we had no idea we would be coming home with a puppy. We needed supplies! We went right away to the pet store and took her in with us. So many people were loving on her, and she was giving kisses all over. They would ask a question and we said, “we’ve only had her 15 minutes! Haha!” The house was completely not puppy proof, and the kids only lived with a much more mellow Toby. They had never had a puppy before. So we had to pick up shoes, toys, and whatever else might be tempting (she likes fabric, like clothes and towels) and get it out of the living area. Hard habits for kids to break! We kenneled Andi at night, and that first night she whined for maybe 30 seconds when she went in, but then didn’t make a peep until 6:30AM. What a good girl. But, we will be starting some training ASAP, as she is a very rambunctious pup. She needs some manners! But it feels like she’s always been with us. Dave is her honorary godfather because his text started it all. The first night home, she was already snuggling on the couch with the kids, just hours after we got her. Kieran was petting her and looked at me and said “I’m so glad we have a dog again, Mom.” That’s when I knew we had made the right decision. Welcome to the crazy, Andi! Here is the link to the rescue we got Andi from. They are in the Rockford, Illinois area. Even if it’s not from them, I urge you to consider adopting from rescues, rather than buying a pet. Rescues are amazing. Hear Julie Jacobs weekday mornings with Pat O’Neill on the Magic Morning Show from 5:45-9AM (she’ll be back on noon-3PM after Lanette Hansen returns from maternity leave! ).